Chris has a headache, a migraine, he’s off form and now he has to work with the ’geeks’ of the school on an Environmental Project, you just know it’s not going to be his week…or is it? He becomes the centre of attention not only of his peers but of local and international media, and all he wanted to do was pick up some litter at the park…Life is never goes the way you think, especially when you have a headache! Following on from the incredible success of Burying Your Brother in the Pavement by Jack Thorne and Moira Buffini’s A Vampire Story, Kilkenny Youth Theatre chose a vibrant and thought-provoking play that asks us what is our responsibility in taking care of our world. 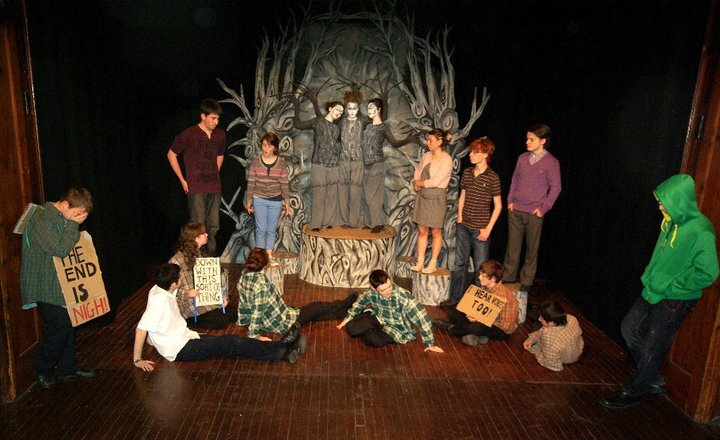 The play jumped between the real world of school and the unreal stories of the students’ imaginations. They battle with working together as a team and getting a job done. Chris, always on the outside of the group, struggles more than others. He says he’s ill but is he just a layabout? In the end Chris’s difference provides the solution to the others problem of getting the job done. Directed by Anna Galligan, Paving Paradise ran at The Barn from the 15th – 17th April 2011 with a cast of sixteen young people.